Giant bent-bamboo pillar cladding ... distinctive features. 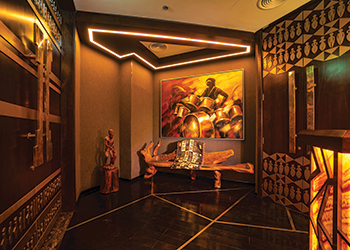 With Kiza, Dubai’s first authentic African restaurant and lounge, the designers have aimed to bring the vibrancy and aura of the ‘Dark Continent’ to the heart of the UAE emirate. 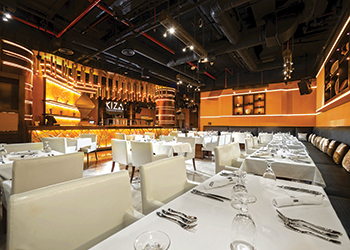 Located in the Emirates Financial Towers in DIFC, Dubai, Kiza is the brainchild of two African businessmen Lukman Akanbi and Joseph Osawaye who envisaged their restaurant would showcase the best of African cuisine in an unforgettable, nostalgic fine dining experience for Africans – but also charm Dubai’s expatriate population with its food and music. “Kiza is a common word on the continent and can mean community or black in many parts of Africa. We want it to become the definitive place to bring together people doing, or wanting to do business with Africa,” says Osawaye. The restaurant, bar and cigar lounge also showcases all that is proud and beautiful about the art and culture of the varied continent. Its logo, a proclamation of faith in a successful future, says ‘Tomorrow Africa’. Designed and built by Dubai-based The First Ferry, an award-winning design firm headed by Skipper Prateek Chaudhry, Kiza combines several elements to fulfil a tough brief. “The look needed to be distinctly African without being overly ethnic; it had to impress without being imposing; and invite every guest, African or not, to enjoy the wonderful mix of food, drink and great rhythm,” says Chaudhry, who believes that meaningful design is born from an amalgamation of form and function, and from aesthetics meeting effectiveness. The months spent agonising over details and shopping from across the world have obviously paid off. Kiza was recently nominated as one of the best-designed restaurants in the world by the Hotel and Property Awards, UK. “What I love about the end result is that the colours are real and earthy like its people, the form flowing, expansive and infused with Africa’s heady rhythm,” says Chaudhry. Well before one enters Kiza, without knowing anything about the nature of the restaurant, its intent is evident. Large cornices along the external wall feature works of African art, musical instruments, massive photos of Africa’s beautiful people and colourful dresses in a way that draws intrigued people inside. The massive solid oak entrance gates are decorated with hand-beaten brass strips and massive brass knobs in a nod to the continent’s long history. As one enters, the first impression is one of immense space and impressive height. The sprawling 8,000-sq-ft restaurant has an unusually high ceiling that has been effectively used to create giant bent-bamboo pillar cladding, reminiscent of the African baobab. To offset the dark woody colours, the tables, chairs and cushions are plain and in shades varying from white to beige. “The Baobab is known as the ‘mother’ tree in Africa; its bulbous trunk storing thousands of gallons of water, its high foliage home to varied life forms, its tall and erect trunks mimicking the continent’s tall, proud women. Design-wise, this brings home the community aspect of Kiza – and everything else flows from it,” explains Chaudhry. The flooring, custom-made from irregularly-cut marble, has been painstakingly put together piece-by-piece for every design element: each triangle a different size, shape and colour, yet coming together in a design unity that looks perfect – much like the 54 nations that constitute Africa, according to Chaudhry. The massive V-shaped bar on the right features a backlit, sunflower-yellow counter painted with undulating lines, inspired by sunbaked giant African grass. 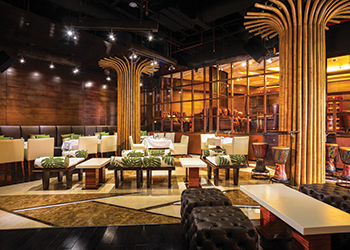 The lighting at the bar has been crafted from bamboo stems custom-built to offer a bank of tiny LED (light-emitting diode) lights. Multi-coloured African drums that have been innovatively fashioned into customised seating are possibly the most ethnic element of Kiza. The restaurant can seat about a 100 people, not counting an area that has been specially crafted so that the chef can cater to private dinner parties. To offset the dark woody colours in the rest of the restaurant, the tables, chairs and cushions are plain and in shades varying from white to beige. “The restaurant’s pièce de résistance – and a feature that places Kiza in rarified space – is its very urbane, very masculine cigar lounge. Predictably appointed with big brown Chesterfields in a separate area of the restaurant, the cigar lounge not only has the inevitable variety of expensive cigars in humidifiers – it is also blessed with a passionate, experienced sommelier who can guide and educate, if that’s your thing,” Chaudhry concludes.